Just like India has diverse culture, there is diversity in food too. You will find hundreds of varierties of food which changes every 100 miles. 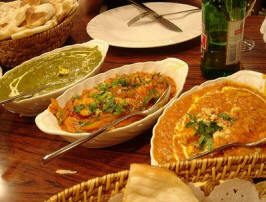 In this section you will find a summary of what to eat and what to avoid while your are traveling to India. We bring taste of India to you. 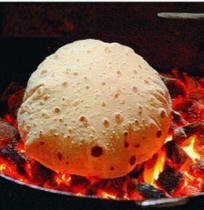 We provide exquisite home made food for small gatherings or large parties as per your need. 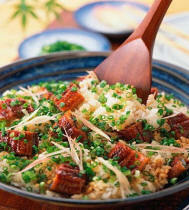 Visit 'Main course', 'Desserts' and other section of this site for recipes. If you have skills in cooking and want to share your creation with the world, please Contact us. The cuisine of India is characterized by its sophisticated and subtle use of many spices and vegetables. Indian food is as diverse as many ethnic and cultural groups in India. Just like Indian culture, food in India has also been influenced by various civilizations, which have contributed their share in its overall development and the present form. Tradition, ethnicity, geographic location, religion or individual preference defines a typical meal. The colonial period introduced European cooking styles to India adding to the flexibility and diversity of Indian cuisine. 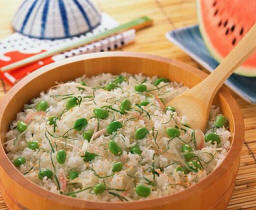 Indian cuisine has had a remarkable influence on cuisines across the world, especially those from Southeast Asia. In particular, curry, which originated in India, is used to flavor food across Asia. As a land that has experienced extensive immigration and intermingling through many millennia, India's cuisine has benefited from numerous food influences. The diverse climate in the region, ranging from deep tropical to alpine, has also helped considerably broaden the set of ingredients readily available to the many schools of cookery in India. In many cases, food has become a marker of religious and social identity, with varying taboos and preferences. For instance, a segment of the Jain population will not consume any roots or subterranean vegetables. We will discuss different groups and their food preferences in various articles here. The staples of Indian cuisine are rice, atta (whole wheat flour), and a variety of pulses, the most important of which are masoor (most often red lentil), chana (bengal gram), toor (pigeon pea or yellow gram), urad (black gram) and mung (green gram). Pulses may be used whole, dehusked, for example dhuli moong or dhuli urad, or split. Pulses are used extensively in the form of dal (split). Some of the pulses like chana and "Mung" are also processed into flour (besan). Most Indian curries are cooked in vegetable oil. In North and West India, groundnut oil has traditionally been most popular for cooking, while in Eastern India, Mustard oil is more commonly used. In South India, coconut oil and Gingelly Oil is common. In recent decades, sunflower oil and soybean oil have gained popularity all over India. Hydrogenated vegetable oil, known as Vanaspati ghee, is also a popular cooking medium that replaces Desi ghee, clarified butter (the milk solids have been removed). The most important/frequently used spices in Indian cuisine are chilli pepper, black mustard seed (rai), cumin (jeera), turmeric (haldi, manjal), fenugreek (methi), asafoetida (hing, perungayam), ginger (adrak, inji), coriander, and garlic (lassan, poondu). Popular spice mixes is called Garam Masala which is usually a powder of five or more dried spices, including cardamom, cinnamon, and clove. 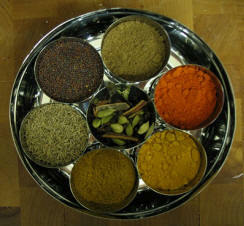 Each region or I should say each individual chef, has a distinctive blend of Garam Masala. Goda Masala is a prevalant spice mix in Maharashtra. Some of the leaves are used in whole or crushed form like tejpat (cassia leaf), coriander leaf, fenugreek leaf and mint leaf. The use of curry leaves is typical of all South Indian cuisine. In sweet dishes, cardamom, nutmeg, saffron, and rose petal essence are used. In India, the term "curry" usually means "gravy". 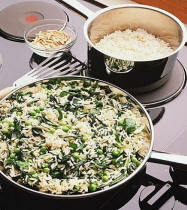 In western countries it is more related to spices in Indian food.